Great location right on Vitosha Boulevard pedestrian area. Comfortable apartment with great views from the balcony. Host was very friendly and welcoming to our dog. Great Apartment. Clean, organized and in an excellent location. Also great service from the apartment staff. Stela and Kalina were very helpful all the way. They provided my family and I with everything we need to explore Sofia and Bulgaria. Highly recommended, 5 star service. The location is great, near to vitosha shopping street, it take 5 mins by foot, and nearby there are many restaurant, it was a modern apartment, the additional toilet is the point for a big group. Recommend for family as it is fully equipped, the most important keys for us is the washing machine. Great location. Quiet area even though it is located in the heart of the city. Overall comfortable apartment setting. Very good location, friendly stuff, excellent value for money. Excellent house, perfect location, very polite house owners! Lock in a great price for Vitosha Apartments – rated 9.1 by recent guests! Vitosha Apartments This rating is a reflection of how the property compares to the industry standard when it comes to price, facilities and services available. It's based on a self-evaluation by the property. Use this rating to help choose your stay! One of our top picks in Sofia.Vitosha Apartments enjoy a central location in Sofia just a few steps away from Vitosha Boulevard. They offer elegant and spacious accommodations with free Wi-Fi. Vitosha Boulevard is Sofia's main shopping street with many luxury brands, fancy restaurants and bars. All apartments have fully equipped kitchens with all necessary dishes and kitchenware. Every apartment has a washing machine. They also have a balcony. 뀐 Located in the real heart of Sofia, this property has an excellent location score of 9.6! When would you like to stay at Vitosha Apartments? Public parking is available at a location nearby (reservation is not possible) and costs BGN 19.56 per day. This apartment features a stovetop, washing machine and electric kettle. All apartments are designed and planned to offer a cozy and comfortable like-home stay in the heart of the Bulgarian capital Sofia. Vitosha Apartments offers short term rental of serviced apartments in the perfect center of Sofia for already more than 15 years. The centre is the best way to see and feel the atmosphere of the city. Most of the tourist sights are on a short walking distance, as well as plenty of restaurants, shops, bars. All apartments are around and on the pedestrian part of Vitosha blvd. For business clients the location is also an advantage, because most of the administrative buildings are as well in downtown Sofia. Staying in the centre does not mean that there are no green areas - close at hand are playgrounds, parks and bycicle alleys. House Rules Vitosha Apartments takes special requests – add in the next step! All older children or adults are charged BGN 19.56 per night for extra beds. Vitosha Apartments accepts these cards and reserves the right to temporarily hold an amount prior to arrival. A surcharge of EUR 10 per apartment applies for arrivals outside check-in hours. All requests for late arrival are subject to confirmation by the property. Please note that the apartments are located in different locations in the Sofia center close to Vitosha Boulevard. Check-in is done at the apartment address which will be sent 2 days before your reservation. All apartments are located at 50 to 2,650 feet from Vitosha Blvd. Please note that guests are welcomed at the meeting point - 9, Bistritsa str., off Hristo Botev Blvd. only with appointment in advance. Please contact the property after booking for check-in arrangements. Please note that for reservations of 6 nights or more, there is 1 free housekeeping. Additional cleaning and change of bed linen and towels is possible upon request and at a surcharge. Please inform Vitosha Apartments of your expected arrival time in advance. You can use the Special Requests box when booking, or contact the property directly using the contact details in your confirmation. The apartment is really nice and located very close to the Sofia city center. Everything is clean and well mantained and the girl which gave us the house keys has been really helpful by giving us a lot of infos and advices about the city life. 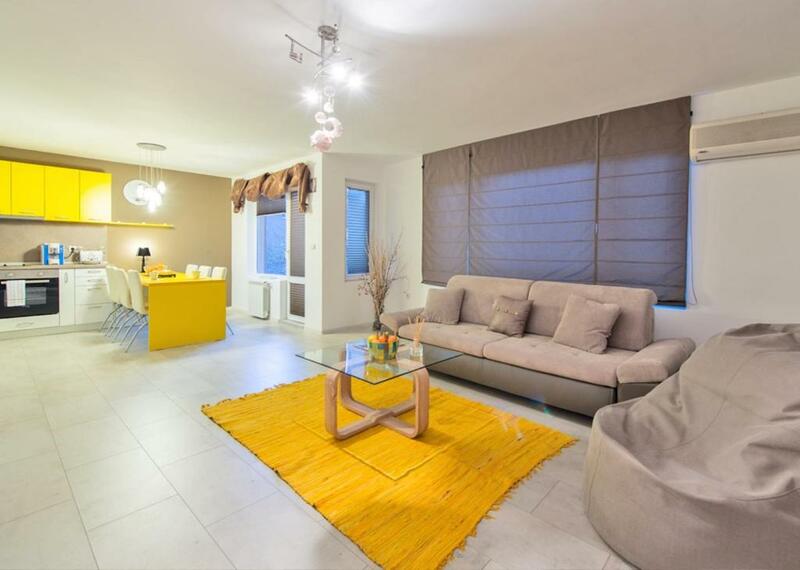 Stunning apartment just a stones throw from the main street. Very comfortable and practical. Had a great time. Stella is a fabulous hostess always helpful and engaging. Thanks for a great weekend. Great location, wonderful apartment.. Lovely Stella was very kind and helpful. Definetely recommend you all.. The location was amazing, so close to the main sites. We were able to walk everywhere. Stella the host was an absolute pleasure to deal with. The size of the apartment was bigger than expected and had all the amenities you could think of! there is really not much to dislike. Central yet quiet location, near Vitosha street, and with several cafes and restaurants nearby. the building is a bit old, but has an elevator and the apartment is in good condition. The place was clean and very well equipped. With dishwasher, washing machine, equipped kitchen, TV and fast wifi. We were a bit late but the cleaning lady with the key waited for us. She did not speak English, but we managed just fine with some help over the telephone and few words I learned beforehand. Somewhat noisy at night with people shouting at odd hours. It was diificult to collect key. Plumbing in bathroom not up to standard...no plugs for basins, shower water drained onto floor. Location stunning and convenient. Delightful restaurants in neighbourhood. The area around the apartment building is well maintained. The apartment is walking distance to all metro stations. Parking could be problematic, but it's not fault of the owner/property. I booked the apartment for friends. Host was very nice. Everything went smoothly. Would definitely book again and recommend it to anyone. Along four days, neither towels nor sheets were changed; the apartment was not cleaned. Although two blocks away of an important avenue, those blocks were dark, with broken sidewalks and broken pavement. Unsafe. Awful decoration as regards curtains, ornaments, carpets, furniture, etc. Parking is a challenge. This is the trade-off for such a great downtown location.